Olympus has released a fix for OS X (Apple Mac) users. Olympus Pulled the original version of studio 2.0 - So the update will not work. Third just run update software within studio, and you should be good to go. I save *all* software releases for downloaded product purchases as disk image files in my archives. Installing on Leopard, I installed from the original .dmg files for v2, v2.1 and whatever the latest is. Then I ran the application and entered my key code, looked for any later releases. Hi, I tried to open the disc image but it won't mount. Clearly I'm doing something wrong. The file downloads very fast, and the disc mounter says that there are no mountable files in the disc image. Need your help! The .dmg files you download should be about 55M and 42M bytes in size, respectively. If they are not, then you have a problem in your download. thanks - i'll change browsers & see if that helps. 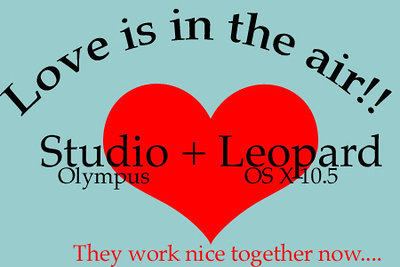 Can't update Studio under OS X Leopard!!!! !